Accepted for IEEE International Conference on Multimedia and Expo (ICME), Shanghai, China, July 2019. 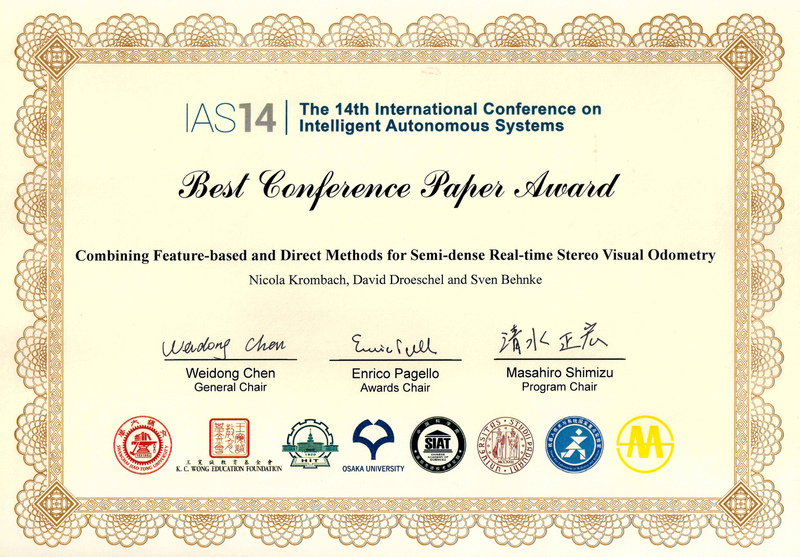 Accepted for IEEE Conference on Computer Vision and Pattern Recognition (CVPR), Long Beach, CA, USA, June 2019. Accepted for European Symposium on Artificial Neural Networks, Computational Intelligence and Machine Learning (ESANN), Bruges, Belgium, to appear April 2019. Journal of Field Robotics (JFR) 36(1):170-182, Wiley, January 2019. In Proceedings of IEEE-RAS 18th International Conference on Humanoid Robots (Humanoids), Beijing, China, November 2018. Robotics and Autonomous Systems (RAS) 109:38-58 Elsevier, 2018. In Proceedings of 27th International Conference on Artificial Neural Networks (ICANN), Rhodes, Greece, October 2018. In Proceedings of 29th British Machine Vision Conference (BMVC), Newcastle, UK,September 2018. In Proceedings of 15th International Conference on Intelligent Autonomous Systems (IAS-15), Baden-Baden, Germany, June 2018. IEEE Robotics and Automation Letters (RA-L), Special Issue on Learning and Control for Autonomous Manipulation Systems: the Role of Dimensionality Reduction, 3(3):2662-2669, April 2018. In Proceedings of 26th European Symposium on Artificial Neural Networks, Computational Intelligence and Machine Learning (ESANN), Bruges, Belgium, April 2018. In Proceedings of IEEE International Conference on Robotics and Automation (ICRA), pp. 3347-3354, Brisbane, Australia, May 2018.
International Journal of Robotics Research (IJRR) 37(4-5):437-451, Sage Publications, 2018. Lecture Notes in Computer Science (LNCS), vol. 9776, Springer, 2017. Dissertation, Mathematisch-Naturwissenschaftliche Fakultät, Universität Bonn, July 2017. In Warehouse Picking Automation Workshop (WPAW), IEEE International Conference on Robotics and Automation (ICRA), Singapore, May 2017. In Proceedings of 25th European Symposium on Artificial Neural Networks, Computational Intelligence and Machine Learning (ESANN), Bruges, Belgium, April 2017. Neural Networks 88: 105-113, Elsevier, 2017. Dissertation, Mathematisch-Naturwissenschaftliche Fakultät, Universität Bonn, 2017. In Proceedings of: 23rd International Conference on Pattern Recognition (ICPR), Cancun, Mexico, December 2016. In Proceedings of 38th German Conference on Pattern Recognition (GCPR), Hannover, September 2016. In Proceedings of 12th IEEE International Conference on Automation Science and Engineering (CASE), Fort Worth, TX, USA, August 2016. IEEE Robotics and Automation Letters (RA-L) 2(1):49-55, 2016. Presented at IEEE International Conference on Robotics and Automation (ICRA), Stockholm, Sweden, May 2016. In Proceedings of IEEE International Conference on Robotics and Automation (ICRA), pp. 5589-5595, Stockholm, Sweden, May 2016. In Proceedings of 24th European Symposium on Artificial Neural Networks, Computational Intelligence and Machine Learning (ESANN), Bruges, Belgium, April 2016. In: Computer Vision, Imaging and Computer Graphics Theory and Applications, volume 598 of Communications in Computer and Information Science, pp. 416-432, Springer, 2016. Dissertation, Mathematisch-Naturwissenschaftliche Fakultät, Universität Bonn, 2015. German Journal on Artificial Intelligence (KI) 29(4): 401-405, 2015.
International Journal of Computer Vision (IJCV)113(3):233-245, Springer, 2015. In: Soft Robotics: From Theory to Applications, A. Verl, A. Albu-Schäffer, O. Brock, A. Raatz (Eds. ), Springer Vieweg, 2015. In Proceedings of European Symposium on Artificial Neural Networks (ESANN), April 2015. In Proceedings of 10th International Conference on Computer Vision Theory and Applications (VISAPP), March 2015. Neural Networks 64:4-11, Elsevier, 2015. Dissertation, Mathematisch-Naturwissenschaftliche Fakultät, Universität Bonn, 2014. Winner of 2015 Georges Giralt PhD Award. In Proceedings of 24th International Conference on Artificial Neural Networks (ICANN), Hamburg, September 2014. Robotics and Autonomous Systems 62(9):1282-1293, September 2014. Lecture Notes in Computer Science (LNCS), vol. 8371, Springer, 2014. In Proceedings of the 9th ACM/IEEE International Conference on Human-Robot Interaction (HRI), pp. 288-289, Bielefeld, Germany, 2014. RoboCup 2013: Robot World Cup XVII, Lecture Notes in Computer Science 8371, pp. 56-67, Springer, 2014. Journal of Visual Communication and Image Representation 25(1):137-147, Springer, January 2014. In Proceedings of 20th International Conference on Neural Information Processing (ICONIP), pp. 450-457, Daegu, Korea, November 2013. In Proceedings of IEEE/RSJ International Conference on Intelligent Robots and Systems (IROS), Tokyo, Japan, November 2013. Finalist for CoTeSys Cognitive Robotics Best Paper Award. In Proceedings of 11th IEEE International Symposium on Safety, Security, and Rescue Robotics (SSRR), Linköping, Sweden, October 2013. In Proceedings of 24th British Machine Vision Conference (BMVC), Bristol, UK, September 2013. In ISPRS Archives of Photogrammetry, Remote Sensing and Spatial Information Sciences. Vol. XL-1/W2, 2013. In Proceedings of 9th International Symposium on Visual Computing (ISVC), Rethymnon, Crete, Greece, July 2013.
at-Automatisierungstechnik, 61(4): 233-244, Oldenbourg Verlag, DOI:10.1524/auto.2013.0016, 2013. In Frontiers of Intelligent Autonomous Systems, pp. 5-16, Studies in Computational Intelligence, Volume 466, Springer, 2013. In Computer Vision, Imaging and Computer Graphics. Theory and Application, pp. 411-425, Communications in Computer and Information Science Volume 359, Springer, 2013. In Proceedings of 8th International Conference on Computer Vision Theory and Applications (VISAPP), Barcelona, Spain, February 2013. Vadose Zone Journal, 12(1), 2013. KI - Künstliche Intelligenz, 26(4), pp. 357-363, November 2012. In Proceedings of IEEE/RSJ International Conference on Intelligent Robots and Systems (IROS), Vilamoura, Portugal, October 2012. In Proceedings of International Conference on Artificial Neural Networks (ICANN), pp. 620-628, September 2012. In Proc. of the AAAI Conference on Artificial Intelligence (AAAI-12), Toronto, Canada, July 2012. In Proc. of the 12th International Conference on Intelligent Autonomous Systems (IAS-12), Jeju Island, Korea, June 2012. Finalist for Best Paper Award. In Proc. of the 7th German Conference on Robotics (ROBOTIK), Munich, Germany, May 2012. In Proc. of the German Conference on Robotics (ROBOTIK), Munich, Germany, May 2012. In Proc. of the 2nd ICRA Workshop on Semantic Perception, Mapping, and Exploration, St. Paul, USA, May 2012. In Proceedings of 11th European Symposium on Artificial Neural Networks (ESANN), Bruges, Belgium, April 2012. In Proceedings of International Conference on Computer Vision Theory and Applications (VISAPP), Rome, February 2012. In Proceedings of IEEE/RSJ International Conference on Intelligent Robots and Systems (IROS), San Francisco, USA, September 2011. In Proceedings of First IAPR Workshop on Partially Supervised Learning (PSL), Ulm, September 2011. Springer LNCS 7081, pp. 110-119. In Proceedings of DAGM Workshop on New Challenges in Neural Computation (NC2), Frankfurt, August 2011. Dynamaid, an Anthropomorphic Robot for Research on Domestic Service Applications. AUTOMATIKA – Journal for Control, Measurement, Electronics, Computing and Communications, Special Issue on ECMR'09, 52(3): 233–243, 2011. Finalist for KUKA Service Robotics Best Paper Award. In Proceedings of NIPS 2010 Workshop on Deep Learning and Unsupervised Feature Learning, Whistler, Canada, December 2010. Intuitive Multimodal Interaction and Predictable Behavior for the Museum Tour Guide Robot Robotinho. In Proceedings of 20th International Conference on Artificial Neural Networks (ICANN), Thessaloniki, Greece, September 2010.
International Joint Conference on Neural Networks (IJCNN 2010), July 2010. In Proceedings of 11th European Symposium on Artificial Neural Networks, Computational Intelligence and Machine Learning (ESANN), Bruges, Belgium, April 2010. In Proceeding of NIPS 2009 Workshop on Large-Scale Machine Learning: Parallelism and Massive Datasets, Whistler, Canada, December 2009. In Proceedings of 9th IEEE-RAS International Conference on Humanoid Robots (Humanoids), Paris, France, December 2009. In Proceedings of the 1st IEEE International Conference on Intelligent Computing and Intelligent Systems (ICIS 2009), Shanghai, China, November 2009. In Proceedings of 18th IEEE International Symposium on Robot and Human Interactive Communication (RO-MAN), Toyama, Japan, September 2009. In Proceedings of IEEE International Conference on Robotics and Automation (ICRA), Kobe, Japan, May 2009. "Recognizing Complex, Parameterized Gestures from Monocular Image Sequences"
"Controlling the Gaze Direction of a Humanoid Robot with Redundant Joints"
"Robust Recognition of Complex Gestures for Natural Human-Robot Interaction"
"In-lane Localization in Road Networks using Curbs Detected in Omnidirectional Height Images"
"Orthogonal Wall Correction for Visual Motion Estimation"
"How to Learn Accurate Grid Maps with a Humanoid"